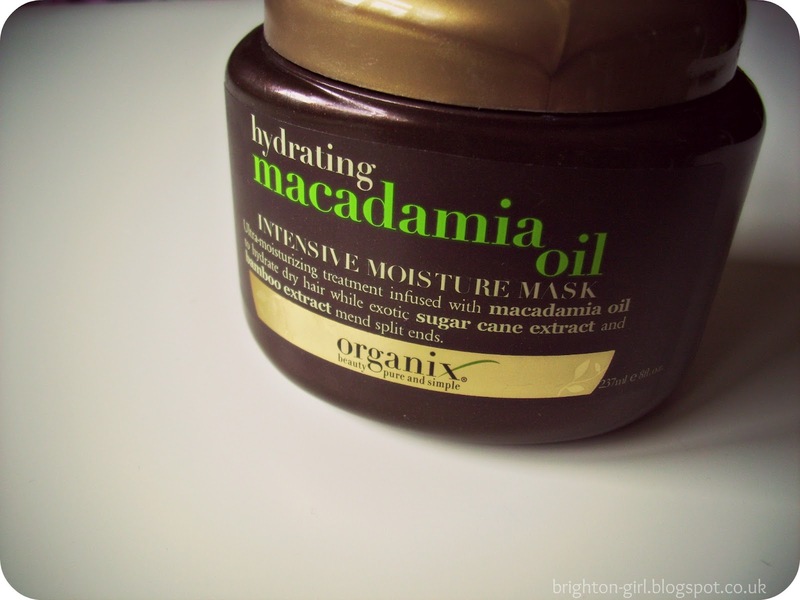 I received the Organix Hydrating Macadamia Oil Intense Moisture Mask (longest name ever) a couple of months ago as a birthday present. After all the recent buzz about the benefits of Moroccan argan oil and discovering that my favourite shampoo contains macadamia oil I was really keen to give this range a try. My hair is rather dry and so I thought the promise of hydration and intense moisture that this mask boasts would be the best product test. First of all, this smells amazing! I'm rubbish at describing scents, but it's kind of a light, soft, sweet smell. On one of the first occasions I used this mask a flatmate at uni commented that my room smelt really nice, when in fact it was my hair that was smelling so good! 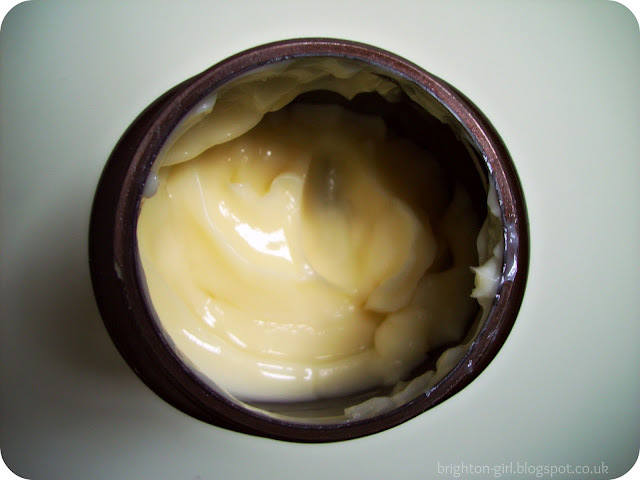 The product itself is light yellow and has a rich, creamy texture. It's super easy to scoop out of the tub and smooth onto the hair. I apply it to the ends and then twist it up into a bun whilst I wait for it to work it's magic. The directions on the back of the tub instruct you to apply the mask to wet hair, then cover with a shower cap and wait 3-5 minutes. Don't do this! I attempted this method and was disappointed at the results. My hair was still really soft, but there was hardly any difference to when I use my regular conditioner. I've found that this product works best when applied to towel dried hair and then left for at least an hour - perfect for lazy Sundays! I have found that this mask has made a difference to the way that my hair feels; it's softer and touchable just as the packaging promises. However, this isn't the best hair mask I've used and I was hoping for slightly better results. This is a product that I really like, however I think my expectations of it's abilities were a little too high before I tried it. I was expecting my hair to feel amazing after using this, and though it does feel soft I've used other masks in the past that have made my hair softer and more manageable. My hair is rather fussy, and sadly this mask isn't for me. I will be finishing up my pot of this, but don't think I'll be repurchasing this particular mask again. However, I really like that the Organix range is both sulphate and paraben free and that natural ingredients are used and so am keen to try other products from the company. I'm eyeing up their their Moroccan Argan Oils and the Vanilla Silk range. Have you tried Organix hair products before? I've been wanting to try a product like this on my hair for the longest time! I have a very small bottle of plain Moroccan oil, but it's so expensive and I bet a product like this would be a lot easier to use. Is it very expensive? 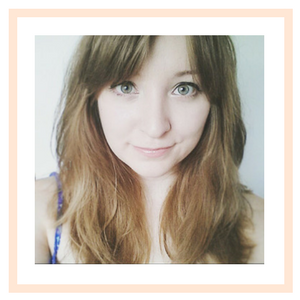 Thanks for the comment on my blog :) I’m moving to Brighton in September so get very excited when I found yours, will definitely be having a proper look! Such a great review, i find its always super helpful to get other blogger opinions before i tush out to buy something! Really great review! I've tried the Morroccan Oil and that seems to be similar! I;m going to give this one a try soon cause my hair really needs it! thank you for the awesome review dear.